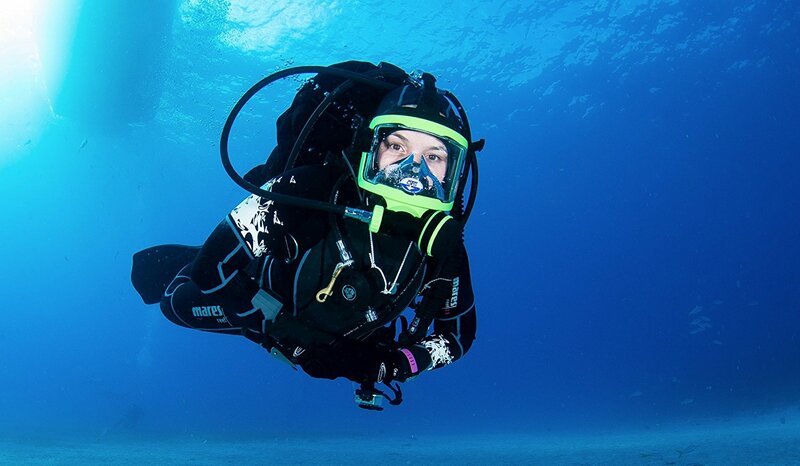 Full faced masks have been used in commercial and scientific diving for quite a while, providing a less cumbersome and lighter alternative to diving helmets. Today more and more recreational divers are using them as more entry level, user friendly, less expensive models have been introduced. Divers enjoy the comfort provided when the mouth is freed up from holding a regulator mouthpiece and there is full face protection from the elements. Oral communication is an option with your fellow divers and even with the surface when an intercom system is installed. This is one reason these masks have been used in commercial diving. Many commercial divers use the OTS Guardian including my close friend and many others in the gold dredging business in Alaska. It is one of the earliest brands and is still held in high favor today. It provides wide visibility and is a sturdy and robust model. The ambient breathing valve is positioned higher out of the water than on other models making it good to use on the surface. With no mouthpiece to clinch, jaw fatigue is eliminated and with this model air circulation is good and the mask probably won’t fog up. It is low weight at 6 pounds and comes in a variety of colors. You’ll note the second stage comes in from the right side. Most first stages will work with the Guardian. and thus decreasing the cost of going to a full face mask. It is possible to take the mouthpiece off and attach your reg to the front of the unit. The Spectrum is suitable to 50 meters for water as cold as 10 degrees C, the performance of the regulator creating the limit of the overall mask. This mask has a simple and effective design and is a reliable and durable mask. Equalizing is done without relying on a nose blog function, which is an absolutely great feature if you’re used to a traditional mask. Reduced weight increases comfort during extended dives. Design features separate compartments for nose and mouth. The top compartment is equivalent to a dual lens mask. It has a 5 point “spider” strap system that enables perfect fit and comfort. A one-way valve provides an optional alternate air source adapter. Direct inhalation is possible with or without an internal mouthpiece. This full face mask comes with a communications package option in 2 sizes with 4 different color options. It also comes with an integrated balanced 2nd stage regulator and a low pressure hose. This is designed with a patented bellows style face skirt and is molded out of premium-grade silicone rubber. It also uses a spring profile alongside a large seal which is double the size in order to provide solid support and a convenient and comfortable fit. The head strap comes attached directly to the face shield, enabling pressure to be equally distributed together with the mask skirt. The unique face strap and seal are patented by the manufacturer. The Ocean Reef Predator T Divers Full Face Diving Mask is extremely well built. The parts were created with high precision enabling the exhaust and the straps to feel unusually comfortable. The surface air valve can also be easily adjusted and is oversized. This scuba mask has been primarily designed for use by technical divers, but is a great choice for a recreational scuba diving adventure in extreme conditions. It is also perfect for divers with medium to large faces. The Predator T comes with a cold water certified, balanced, on demand, integrated regulator, as well as a reduced internal volume which makes excellent buoyancy possible. It also has an improved visual field, with the visible light transfer within the visor at 92% and comes equipped with a directional exhaust valve which has been designed to directly control the direction of the bubbles away from the communication unit so as to avoid free-flowing of water on the mask. It is designed for cold water usage and has a balanced, on demand, integrated regulator. The polycarbonate visor is siloxane double coated to resist scratching. It has a 4 position directional exhaust valve, dive/pre-dive switch and a lifetime warranty! But what makes this model immediately noticeable is the extender, which comes in a kit (frame and accessories), and the SAV (Surface Air Valve) is included. Mask Clearing – While a full-face mask is not very likely to flood, when it does happen it is a little harder to clear, due to the larger volume. The situation is exacerbated in that while the mask is flooded it may not be possible to breath as long as it is flooded, depending on how much water is in the mask. Difficulty Putting It On – There are several straps that all need the correct adjustment. If the mask is not placed in the proper position, it may flood or fall off. Dropping The Mask – With the usual dive mask, if you drop it you simply methodically retrieve it or get out a replacement. With a full face mask you not only lose use of the mask, but also the regulator, so there is increased urgency in getting it back on in position. Fortunately the regulator hose is tethered to your gear, so finding it is a relatively quick process. Skills Deterioration – Because of the ability to talk when using a full face mask, some divers can tend to forget the standard hand signals, making communication more difficult when diving in a standard mask configuration. Lack of practice in mask clearing or regulator recovery when using a full face mask can result in the same kind of deterioration to those skills. Cost and Weight – Of course full faced masks are more expensive and heavier. To safely use a full face mask special training and practice before going to open water should be considered. Underwater Chat – Some folks are unusually gabby. The tranquil underwater atmosphere may not be the same when diving with someone using a full face mask who just loves to talk. If that is aversive to you, you had better choose your dive buddies carefully and/or set some ground rules before submerging. The Decision – Is a Full Face Mask For You? Increasingly recreational divers, as well as technical and commercial divers, find that using a full face mask can be quite advantageous. It’s really a matter of your own personal preference whether to use the traditional mask and regulator set-up or a full-face dive mask. Each of the 6 reviewed here comes with its own set of features, including advantages and disadvantages. You should judge based on your own needs which is the best option for you. I used to scuba dive a few years ago, but have not done it lately. I only used the standard masks and never used the full face ones. It was just easier to me to use those rather than the full faced because i was used to it. Would you consider a full faced better than a regular mask and regulator? Thanks a lot for your comment and question, Chris. The big advantage is that you free your mouth from having to clinch the mouthpiece, which is more comfortable and allows conversation. These full faced masks are easy to use. If you haven’t done so already, I suggest to watch the videos for the different models on the page to give you a more concrete idea of what it’s like. 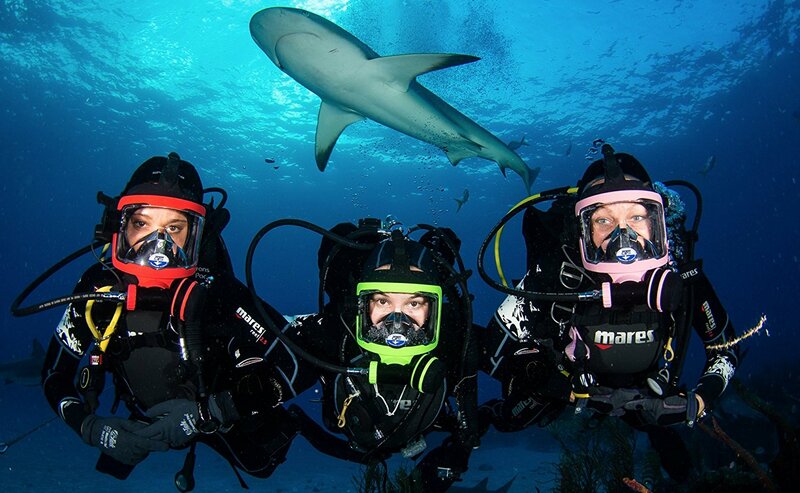 Diving with these masks is fun!